For a band that has yet to release its first proper album, Chicago’s The Kickback certainly have received some high profile attention — from both Rolling Stone and Jim DeRogatis. Indeed, the debut album is currently being recorded with Jim Eno from Spoon. The New Music Seminar brought The Kickback to NYC a couple of weeks back for a showcase at Pianos. Its easy to see why the band is getting serious attention — they’re tight, the songwriting is excellent, the live energy is contagious, and bandleader Billy Yost has that x-factor the separates up-and-comers from never-will-be bands. The highlight of the set was the show’s finale, and absolutely stunning number called “Rob Our House” which we’re streaming below. The song draws upon the pure helpless rage of a crime victim filtered through Yost’s magnetic stage presence. The song left me speechless and definitely wanting to see more of the The Kickback when they return to NYC for CMJ in October. I recorded this set with the Sennheiser cards mounted to the front plexiglass out of the soundboard booth and mixed with a feed. The sound quality is quite excellent. Enjoy! 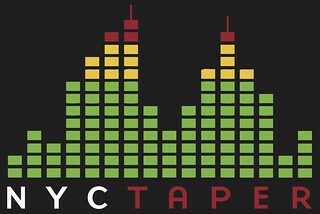 If you download this recording from NYCTaper, we expect that you will PLEASE SUPPORT The Kickback, visit their website, and purchase their official releases from the links at their website and the Bandcamp page [HERE]. Thanks for this. The Kickback are a bunch of lovely gentlemen.